Is it the time of trimming your garden plants? Indoor garden tools like pruners are the best option for this job. This tiny scissor like tool cuts the branches in right angle and helps you to keep the plants/trees shape or grow more flower/fruits and so on. Expert gardeners always equipped with different sizes of pruners in their tool kit. That is why today we are going to talk about to Fiskars pruners that are perfect for indoor gardening. If you are also looking for an ideal tool for trimming your plants, then keep reading. After test some of Fiskars pruners we have end-up with these two for smart indoor gardening. No matter how many trees you have in your roof-top or balcony, you can keep up with them with these two. 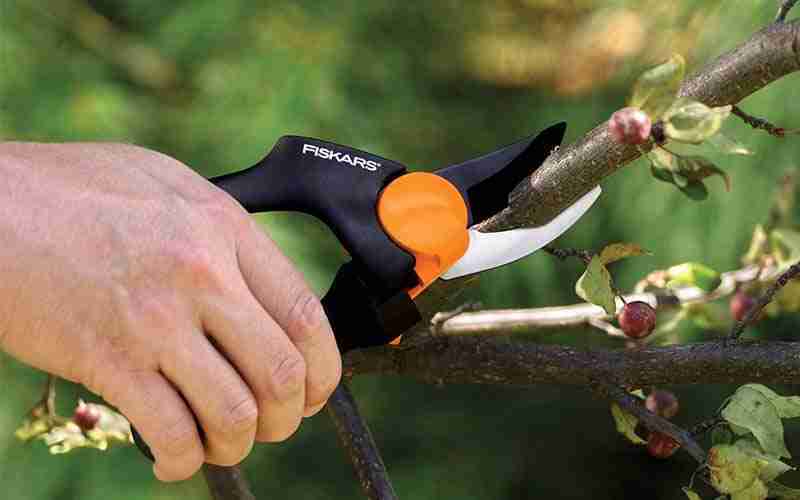 Our first best pruner is Fiskars PowerGear Pruner. The design of this power gear is to increase the double your cutting power. Its rotating handle opens parallel and enhances your hand strength. Also, the handle is adjustable at the initial size. This pruner comes with a decent and robust size of the blade. It cuts clean without damaging the tree. It is 5.5 inches in wide and 10 inches long. The pruner is quite light about 1lb. Comparison to any traditional single-pivot tool, you will much enjoy trimming or pruning with it. It’s three times fast and efficient than any other tools. The compact size of it makes it easier to hold and work with. Also, its low friction work ability allows elders to work more frequently. However, you are lefty; the pruner may feel a little awkward to work with. Suitable for different types of pruning and trimming. Has the ability to increase the pruning power. Rust-proof blades stay sharp for longer. Light and sturdy nylon handles. Easy and safe for use. The pruner is not that suitable for left-handed users. Tips: Get a blade kit! That will help you lot to adjust the sharpness according to your work. If you want a light, a sharp pruner for cutting rose bunches or the buganvilias; then you might like this one. 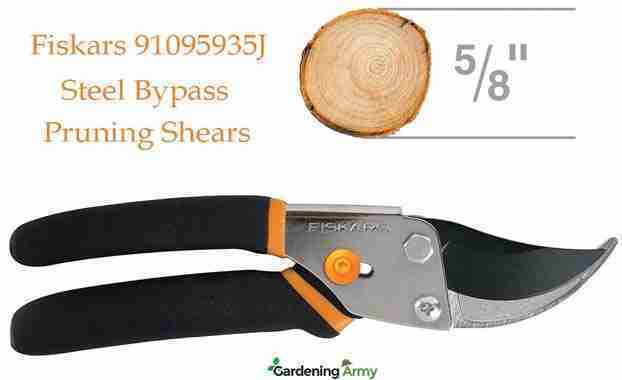 The Fiskars 91095935J pruning shears are designed to cut the light to medium branches. It’s an entirely hardened precision-ground steel blade. That is why you can use it for a long time without losing the sharpness. Its low friction coating makes the cutting a lot easier. The blades come with non-slip grips, self-cleaning sap groove, and overall steel construction. Comparison to our first one this one is slightly old in design but better in durability. Additionally, the blades of the prunes design with bypass method which can cut clean without damaging the plant. You can cut with this about 5/8 inch thick brunches maximum although it has low friction coating that helps the smooth glide more through the wood and prevents gumming up with debris or sap. As a result, it stays runt free for the maximum time. Suitable for cutting light and stem branches. Stay sharp for a long time. Maximum cutting capacity- 5/8 inch diameter. Not suitable for massive brunches. 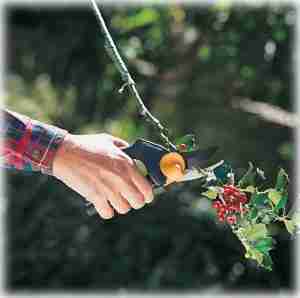 Tips: Bypass pruners are suitable for clean cuts on live plants. Anvil-style or straight type pruners are better for dead limb pruning. Fiskars has lots of other option among Fiskars pruners and other garden tools. You can check their website to find out more. 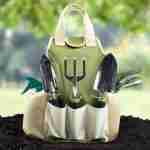 We are looking to make a full review of Fiskars garden equipment for futures. Consequently, our readers and fellow gardeners learn more about all the useful items of this brand. So, stay with us and happy gardening!